Evergreen Advisors Capital (“Evergreen”), a boutique investment bank, is pleased to announce that it served as the exclusive financial adviser to Perthera, Inc. (“Perthera”), a leading precision medicine company, in its institutional Series A financing. 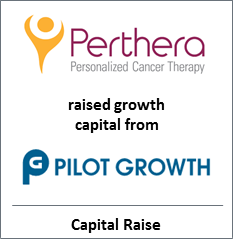 Perthera is the market and technology leader in Precision Cancer Analysis (“PCA”), which provides physicians a more accurate understanding of a patient’s cancer and thereby the ability to identify prospective treatment options personalized to the individual patient. At the same time, a PCA provides individuals access to a world-class actionable therapy plan wherever in the world they may be. Morgan, Lewis & Bockius LLP served as legal counsel to Perthera.